In the second year of my PhD one of the reviewers at my annual review queried the metastasizing scope of my thesis. As it started to slip from a transnational history of Australian protest into a sort of weird agglomeration of case studies touching on everything from 19th Century vaccinations in Britain to the Boer War, he said, not unkindly, “you don’t have to account for the impact the Romans had on the Vietnam War”. He said that most PhDs wind up looking like a “history of everything” at some point, but that I’d still have to rein the scope in. I think I’m at that point in this project, and I’m not alone. It’s amazing how quickly writing on the history of work, post-work imaginaries, or the future of work shifts to encompass just about everything else. Take as an example just the names of the four books I’m currently reading: Arendt’s The Human Condition, Dardot and Laval’s The New Way of the World, Tim Dunlop’s The Future of Everything and Andrea Komlosy’s Work: The Last 1,000 Years. The scope of this literature is staggering. At first I was surprised by this, until I sat with it for a while. As a historian, I’m of course familiar with Marx – whose entire theory of power and change rested on the notion that work was all-encompassing, and which side of work you were on – labour or capital – determined your entire worldly politics. But Arendt does the same thing – for her, Work and Labour are a two thirds (or half, or two fifths, depending on where contemplation and reason fit) of all human activity and define not just all human lives but humanity itself. For Dunlop, ‘work’ breaks the banks of its own chapter and is implicated in the ‘wealth’ and ‘education’ chapters as well. Everywhere I look as I read in this literature, I’m reminded how central work is to our political lives. The journalist Paul Kelly – by no means a paragon of socialist theory – wrote a book called The End of Certainty in 1992 in which he coined the phrase “The Australian Settlement” to capture the pillars of Australian public political life that were in the process of being dismantled in the turn to neoliberal model of state governance: racial immigration exclusion, tarriffs, wage arbitration, and welfare. At least two of these four are intimately entangled with the notion of work. The Australian Labor Party is the oldest political party in Australia, the ‘Workingman’s Paradise’, and Australia is hardly the only country with a functioning labour party. Work and democracy are of course intrinsically linked, because equality is a core tenet of democratic citizenship, money is one of the key measures of equality, and work is one of the three most important ways for money to change hands. Wage income or labour compensation as a proportion of all income has been declining since the advent of neoliberalism (FoE, 181), which means that to talk about work at this historical moment is to confront rising inequality. In large organisations, we enter a hierarchical system where we are ranked according to pay and authority, and subordinated to someone whose whims we must accommodate. This appears to have been based on the military model of organisation from the early 20th Century (NWotW, 23). But even if we find ourselves free from that relation, like a revolutionary ‘yeoman’, an entrepreneur or ‘freelancer’, we are still beholden to those others who we call customers or clients. If corporations have the military as their model, so does the contractor: a ‘freelancer’ is a mercenary. The term dates back to the days where heavy horse formed the core of most armies but before nationalism could be relied upon to furnish the state with soldiers – so, at least the 17th century. When we work we always enter into a relationship of inequality, with our bosses, or our clients. They have the money, we need the money. Our work is what we offer to justify the transfer. And due to automation and casualisation, it’s a less compelling offer to the wealthy than it’s perhaps ever been. He goes on to point out that “property is not really a relation between a person and a thing. It’s an understanding or arrangement between people concerning things.” (D5k, 198). We fail to notice this because the notion of “absolute power” is missing from the way we talk about our things, and we instead prefer to think of “rights against all the world” to describe the exclusivity of private property. Instead, following Orlando Patterson, Graeber argues that the only reason our property laws look the way they do is because in Rome, there was a class of property with free will that needed to be reined in – slaves. “A wage-labor contract is, ostensibly, a free contract between equals-but an agreement between equals in which both agree that once one of them punches the time clock, they won’t be equals any more. The law does recognize a bit of a problem here; that’s why it insists that you cannot sell off your equality permanently [you are not free to sell yourself into slavery]. Such arrangements are only acceptable if the boss’s power is not absolute, if it is limited to work time, and if you have the legal right to break off the contract and thereby to restore yourself to full equality, at any time. (D5k, 120). In light of this line of argument, consider the neoliberal rump state – the minimal state powers that advocates of neoliberal deregulation and privatisation aim for: the power to protect property, enforce contracts, and defend its borders. Or, as Snricek and Williams put it: “neoliberalism demands that the state defends property right, enforce contracts, impose anti-trust laws, repress social dissent and maintain price stability at all costs” (ItF, 53). Slavery and the military are only two aspects of work that a history of the present might consider. Dunlop, Arendt, and Komlosy provide a few more. Komlosy outlines a framework for tracking these changes across time — which is what social historians of the long duree do. It includes some categories that exist on their own, like subsistence work (or Arendtian Labour), and others that form dichotomies, like free and unfree work. It’s interesting to note here that both Komlosy and Arendt, though establishing their own typologies, refuse dichotomies like productive/unproductive or skilled/unskilled. A new framework is a good way to understand a long span of time, but a bad way to think about contingency because the framework itself contains traces of the present. It does reveal change over time, however: at certain historical moments, some things get to count as work, while others don’t. The most important part of this is that this definition changes over time, and, as Gabriel Winant points out, calling something ‘work’ matters. Dunlop offers more pieces of a History of the Present, noting the existence of the ‘yeoman farmer’, in its American ‘founding fathers’ model. It’s testament to Dunlop’s good historical sense that he resists the tempting (and anachronistic) comparison to the contemporary entrepreneur, instead describing them as “independent of employers” a subtle but important difference (FoE 169). The problem with a wage – money paid by the hour for work – was that it made you a ‘slave’, just as Graeber pointed out in relation to the history of contracts and property. What Dunlop and Graeber show us about work is that our contemporary (and historical) ideas about freedom and liberty are partially based on uninhibited free will; any restrictions are unbearable. Dunlop also talks about Benjamin Franklin’s idea that ‘time is money’ as a precursor to our current obsession with the hourly wage, which provides us with our contemporary model of productivity. The point of a history of the present isn’t to find the origin of our assumptions – it’s to reveal that there is nothing historically stable about them, so that they may be worried, destabilised, disrupted (and not just in a tech startup way, for profit). Komlosy, Graeber and Dunlop provide the first few points of departure for such a history – researching Franklin, contract law, and looking how what gets called ‘work’ shifts over the last millennium. There’s more to this picture. People often talk about the role of automation during the industrial revolution as the origin of our 8-hour day and our notion of productivity being output over time. And then there’s Weber and his famed (or infamous) Protestant work ethic. Both Arendt and Komlosy point out the religious origins of the notion that hard work is a way to endear oneself to God. The more I read, the more I realise this project hangs between liberalism and Marxism, Weber and Marx. It’s not yet time for a re-scope. I’m not off the rails yet. The history of work might actually be a ‘history of everything,’ as my reviewer pointed out in second year. Even if it’s not, there is a reason to consider the Romans. 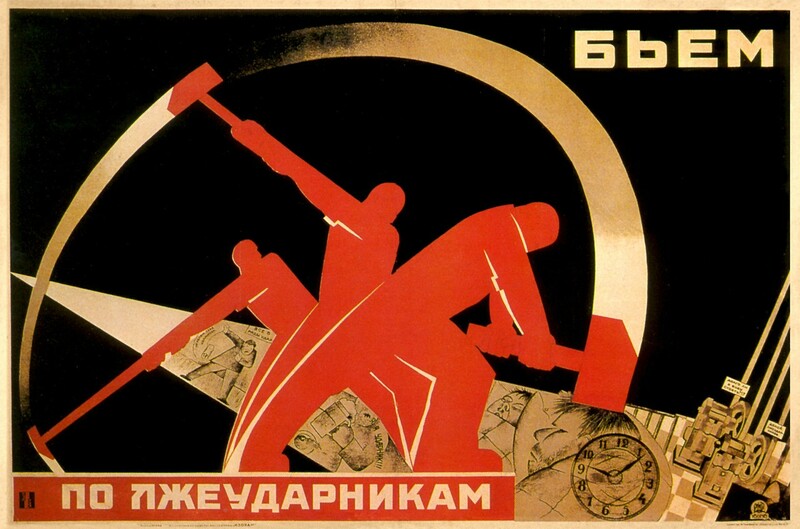 Featured Image: “We Smite the Lazy Workers,” (Soviet propaganda), image from Russian State Library via here. Used without permission.